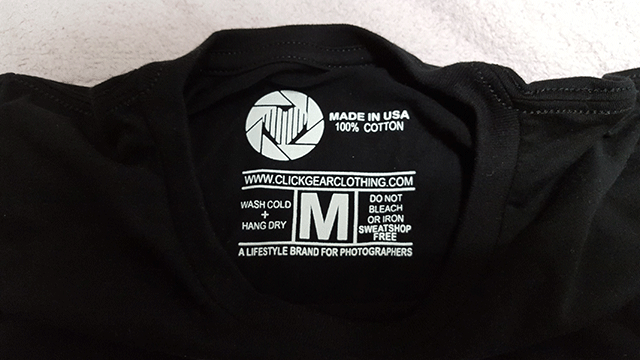 CLICK GEAR CLOTHING is a US t-shirt and apparel brand targeting photographers. It’s for photographers, by photographers. 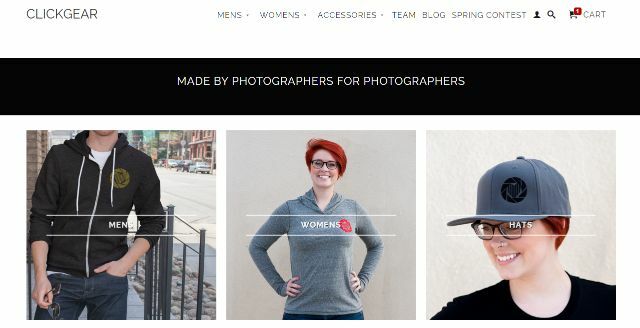 Our mission is to inspire the photography community while giving photographers apparel that they are proud to wear. I received a medium sized black t-shirt from Click Gear Clothing in the post. I think it’s a standard American Apparel ladies tee but I wouldn’t stake my life on it. It came in a standard white mailer which included a sticker and a Thank You postcard. 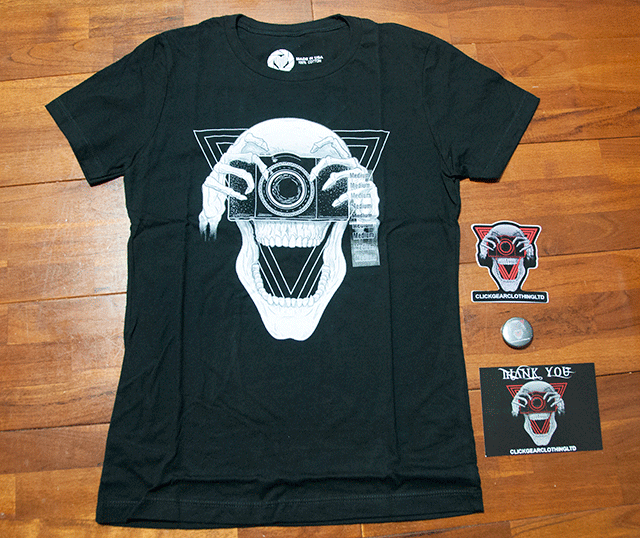 Click Gear Clothing design and sell t-shirts and other apparel for photography enthusiasts. This t-shirt seems to be a variation of their very first t-shirt. 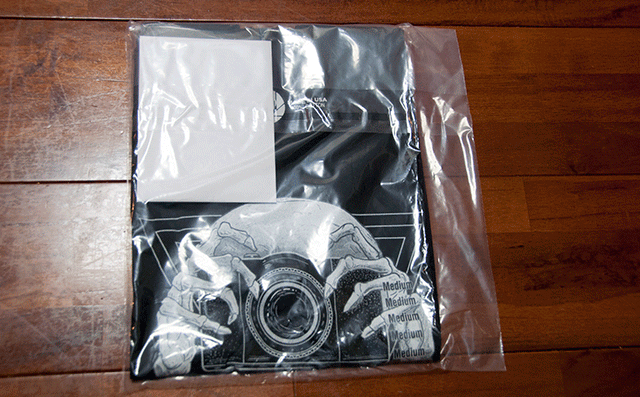 Our original photographer t-shirt. This is the tee that started it all. Launched on February 14th, 2015 CLICK GEAR was born. As photographers, we feel that we deserve to have clothing and apparel that represent who we are. Thus our first design and the original Creeper. First off, I’ll say that the design is not for me. It’s called the Creeper and it is a bit creepy. My wife doesn’t like things like this and my daughter wouldn’t be happy if we wore it. It’s a creepy skull t-shirt. But, that’s just a matter of taste and the fact is that skull t-shirts are very popular and some photographers might love this kind of design. Now that we have talked about my taste in t-shirts, it’s time to talk about the t-shirt itself. The skull and bony fingers are drawn very well and the positioning of the camera in the center of the skull adds to the creepiness. At a glance, it might be mistaken for a cyclops but it’s the camera lens that we are looking at. The camera’s positioning in front of the face prevents us from seeing the eyes which are thought to be the window to the soul. And in some culture, I read somewhere, they believed that their souls were stolen when someone took their photo. And if the photographer happens to be a ghoul of some sort… Anyway, I’m probably reading more into this image than is really there but regardless, it is a powerful design that will make some people curious and others uncomfortable. It’s a skull design but expressive and even vigorous, somehow. The print is soft and impeccable and the 100% cotton t-shirt, which I suspect is an American Apparel, is nice and soft too (there was no label). There is a round logo on the back of the t-shirt below the neck that features an aperture with a heart in the center. I’m not sure if aperture is the correct term for the hardware but it’s an image that any photographer will recognise. It doesn’t take away from the shirt and if photography is your thing, it probably adds to it. On the inside neck, you can find the logo again with some care and size details. It looks very professional. As mentioned above, there was a thank you postcard and sticker included. The postcard is made from high-quality glossy stock and has a coupon for your next order. The sticker is die cut and looks pretty good. It’s a color version of the same image as on the t-shirt and has the company name printed on the bottom. There was also a button (or badge) with the skull design and text. You can see them in the first image above. The mailer also had a logo sticker on it. Click Gear Clothing has just the type of website that I like. Clean, modern and easy to navigate and on top of that, they have a fantastic blog with lots of cool and useful information for photographers. They are also quite active on social media. The selection of items is a little small but they just started out about 1 year ago so it’s not so bad. I like that they have a theme (photography) and are sticking to it but of course, that also narrows their customer base. Some of the t-shirts are mockups. I guess that is because they haven’t actually printed them. I could be wrong. Mockups are not something you want to see on a photography site, though. The t-shirts are $30-$35 which is not totally unreasonable for a niche brand. It’s a good quality t-shirt with a well-crafted design. The website is clean and easy to navigate and Click Gear Clothing cater to a niche customer base. That particular niche, photography, is so big that it has niches of its own, so there is a market for what they are selling. They don’t have a lot of variety and I think they need to expand their selection if they want to stay fresh. As a photographer, this t-shirt is an inspiration and motivation of our strength. I love this Cool T-shirt .